After 4 years of painting toy soldiers, making terrains and dithering over rule sets, 5 days ago I told myself to take a rule set and play a game. I made one previous attempt with Le Feu Sacre, but got bogged down in the details and did not finish the game. 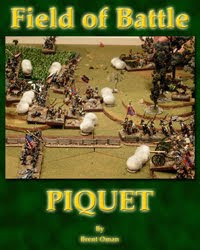 An informal poll conducted by myself on TMP appeared to suggest that Field of Battle and Le Feu Sacre are the most popular mainstream rulesets played by solo wargamers, like myself. I like historical scenarios so I picked the Engagement at the River Coa, with which I was already familiar. I used the following order of battle. I used the random die generator on the Piquet Yahoo Site. I have no line hussars or chasseurs painted, so I had to use some guard and line lancers and some guard chasseurs. I have a 9x5' modular terrain table(no roads yet), so I set up something similar to the historical setting. The River Coa is in the extreme west, the class III town of Almeida is in the north central and the Vale of Maida is 2/3 of the terrain east. There is a class III forest blocking direct access to the bridge of the River Coa, with class I terrain, north of the forest. A small forest represents the vale. The River Coa is not fordable. The rest of the terrain is class I. The French units all start east of the Vale of Maida, with the orders to advance to the bridge over the River Coa. French victory point locations were placed just west of the Class III forest north of the River Coa and at the north edge of the bridge. The view looking from east to west with the French forces in the foreground. The British situation was a little different as I tried to mirror the historical situation. Crauford starts the game with Barclay on the south side of the River Coa, he has deployed Beckwith far forward in around Almeida. Anson is deployed north of the River Coa, but west of the class III forest. Even though all the British infantry units are light infantry only the Cacadores are deployed in skirmish order. Crauford has ordered Beckwith to reconnoitre forward, Anson is deployed in order to protect Beckwith, in case he engages the French. Barclay has been ordered to hold the bridgehead to cover any retreat of Beckwith and Anson. British victory points are placed north and south of the bridge. I do this with trepidation as this is my first go at the FoB rules and I know little about wargaming. To make the scenario work, I need a few extra rules though. Since this is a reconnoitre/retreat scenario for the British. I need a visibility rule. Using standard FoB measures, I make visibility at 1/2 mile (36"). That seems simple, but I also need some way to spot the French for the forward British units, plus a method for Command Groups to communicate with each other. So if the French are spotted (come within 36" of any British unit), then the British unit or the CG Commander needs to move in order to contact either the CinC or another CG Commander in order to activate the specific CG's orders. Contact is defines as being 1/8 mile (9 inches). This does have the commanders running about, going out of command with their units. We will have to see how it goes. Maybe in the future, I can work out some ADC rule to serve this purpose. So here we go!!! Looking north at the town of Almeida, the 3rd Cacadores are deployed forward. Looking from west to east. The French advance with Simon's brigade leading the way. Barclay deploys the 1st Cacadores east. The 3rd Cacadores are enveloped by the leading French brigade. The 26e ligne fire, the legion du midu fire, Cacadores fire and fall back. The legion du midi engage in Melee with the Cacadores (down 3UI), they rout back. The 43rd retreat back out of command. The 2/95th have to extricate them selves from Almeida (lucky Sharpe is there!!!). Beckwith's rally attempts fail. Barclay informs Crauford that the 1st Cacadores have seen the French advance. Crauford contacts Anson, he then advances through the forest to support Beckwith's withdrawal. The RHA are left with Crauford to protect the withdrawal. Barclay sends the 52nd forward and deploys the 1/95th in line to protect the bridgehead. Back at the front, there is lots of action. Anson has broken through and is causing havoc among the French (lucky die throws help). Legion du midi are destroyed in Melee. Great cards for the British, the Light Dragoons destroy 6/26e and the KGL Hussars destroy the legion hanoveriene. The 2/95th somehow or other escape intact from Almeida and withdraw. The British cavalry take Gardanne's cavalry units in the flank. Multiple fires from the French FA and HA, as well as elements of Ferry's infantry brigade soften up Anson's cavalry. Eventually both the 16th Light Dragoons, the KGL Hussars and French 15e Dragoons are destroyed and the 25e Dragoons rout off the table. Aside from the cavalry the British withdrawal is going well. But then tragedy strikes Crauford roll a D12 survival test and gets a 1 and dies. Beckwith of the 95th is promoted to CinC and MG Picton gets teleported in as GC for the Beckwith's brigade. The French cavalry under Lamotte advance west of the forest with Ferry's Infantry brigade following. Picton successfully rallies (it must be the tophat) his new brigade and they start their withdrawal to the bridge. The advance of both the British and French forces is quite rapid, but on the second IP generation the die is equal, the cards are reshuffled. All elements of Barclay's brigade are south of or on the bridge. The 1/95th and 1st Cacadores are in position to give flanking fire to the French advance. The 2/95th are attempting to deploy in line to also provide flanking fire. The RHA under Anson is in position. The 43rd are almost there. The RHA, 1/95th and the 1st Cacadores fire with devastating effect (and good die). The 4/26e ligne and the 3e Hussars (masquerading as lanciers polonaise) rout and the 5/26e fallback. But alas, the 43rd taking a flanking fire from the French FA and are destroyed. GAME OVER as all the British units are now south of the bridge. I think I have probably made some errors in the counting, but I got as follows. British: 3 units lost, 2 victory points achieved and at least 17 AMP's lost. French: 5 units lost, 1 victory point achieved and at least 14 AMP's lost. Who won, I am unsure, I will let you judge. I did have a fun and I will definitely continue to use the FoB rule set. I'm glad your enjoyed the game. Piquet style gaming is great for solo play. You have a great looking setup there. I'm envious! Thanks von Peter, I am afraid I may have favoured the English.